At Aston Homes, we believe that some home features should be expected and always come as standard. This is why every Aston Home is packed with inclusions that many builders don’t include in their standard pricing, knowing that you’ll want to add them later at an additional charge. Sure, some people may accept out dated lighting options, but nothing lights up a room quite like the latest tech in down lights! Plus, there are other benefits beyond their stylish look! In today’s blog, Aston Homes explain how this particular feature ensures your house is next level from day one. The abbreviation LED stands for ‘Light Emitting Diode’ which is a semiconductor device that converts the electricity into light – impressive stuff, right!? When it comes to downlights however, there are a number of quality variations on the market. Aston Homes choose to include high quality LED down lights in every room of our bespoke home designs including living areas, bedrooms, bathrooms, laundry, butlers pantry (if applicable), the front porch and even in the outdoor alfresco. The only area under the roof line they are not included as standard is in the garage (which can be included at an extra charge). Not only do LED downlights provide more light than the outdated alternative, they use minimal power which equals energy efficiency. LED lights use approximately 85% less energy than halogen or incandescent lighting options. The combination of their long lifespan, energy saving technology and sleek design makes them Aston Homes’ first choice when it comes to delivering significant savings on your power bills. Aston Homes’ LED downlights also have scope to be upgrade with dimming capabilities, an option you may choose for the rooms you want greater lighting control. Dimmers add longevity to the lifespan of the each light as well as lowering the amount of electricity exertion in each globe – another bonus efficiency feature. Dimming can also be used for added ambience. If Sunday night is movie night in your Aston Home theatre room, grab the popcorn, dim the lights and prepare for your very own cinema experience! LED lights emit far less heat than halogen which means they are a much safer option in your home – they reduce risk of the insulation in your roof cavity catching fire. And, in the summer months when you are using your air conditioner to keep cool, they do not counteract the cool by creating more heat. At Aston Homes, what you see really is what you get! 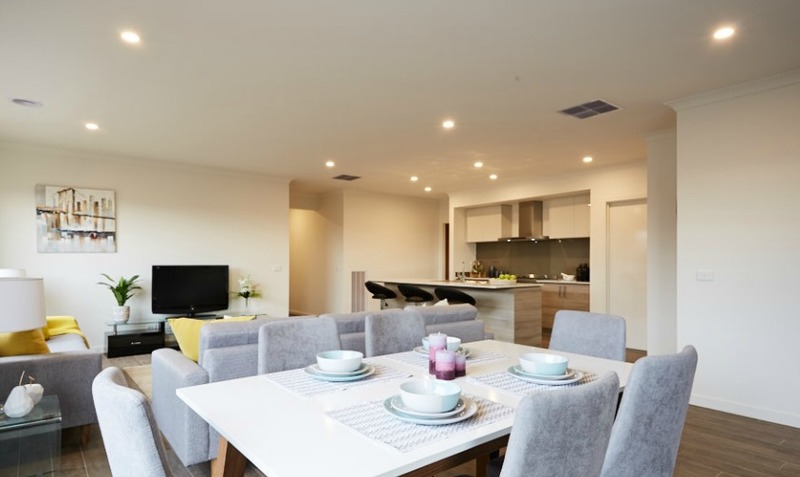 Just like our fantastic downlights, all of the inclusions that you see in our display homes are our base standards – that means they’re included in our base price. Looking to learn more about the Aston Homes difference? Read about each of our floorplan’s inclusions here.